We’ve been back from our trip to Harbour Island for about a week, and we are still riding a major post-vacation high — and missing the warmth and sun like woah! We received so many messages from you all asking about our trip itinerary and recommendations, so I wanted to put this guide together quickly while it was all fresh in my mind. I had a hard time finding a lot of information about the island, so we weren’t sure what to expect — but if you’re looking for a laid back beach getaway on a little island oozing with charm, need to put Harbour Island on your list! When we booked our trip last fall, the Bahamas were on our radar, we just weren’t sure which particular island to visit. Each one seemed to provide a different experience and vibe. We both prefer our vacation spots to be a little off the beaten path and less touristy, so we set our sights on the “Out Islands,” which are more remote. I had read a few articles about Harbour Island and fell in love with the stories of this tiny, charming island with very few cars and an endless pink sand beach. Then I heard it mentioned on an episode of Gossip Girl (because I’m 17 years old) and I took it as a sign, so I started digging into it a bit more…and I was hooked. Harbour Island (or as the locals call it, “Briland”) is a little slice of paradise (actually little, it’s only three miles long and half a mile wide). The pink sand beach spans the entire east coast of the island, and yes, the sand really is pink and it’s softer than flour. The vibe is super laid back, even the luxury hotels fit the island vibe and are chic, yet understated. You are totally immersed in island life all around you — you’ll see beautiful beachfront houses right around the corner from more run-down cottages with roosters running about — it’s part of the charm and we loved that. And really, the roosters are everywhere! And cats, lots of cats! I can truly see why people come back year after year — it sort of gets into your soul a bit. You can’t fly into Harbour Island directly, so you’ll want to fly into Eleuthera (which is the larger island it’s off the coast of). We went from CLE > Atlanta > Eleuthera. Once you land, you’ll take a quick taxi ride to the main dock, then a five minute water taxi ride over to Harbour Island. You won’t need to book anything ahead of time; there are tons of taxis waiting at the airport, and the water taxi boats run every 15 minutes. Make sure you have cash on hand as all of these trips cost a few bucks per person. The U.S. dollar is accepted, so you don’t have to worry about exchanging your money, either! We were staying at Valentines, which has its own marina, so the water taxi was able to drop us off right at our hotel. Otherwise, it will take you to the main dock on Harbour Island, and you can rent a golf cart right there. I’d highly recommend renting one, it’s the main form of transport on the island (budget about $50/day). You could walk or rent bikes, but some of the roads can be unmarked or dirt roads, there are no sidewalks, etc…There were a few roads we went down where Jim and I were laughing like omg, there’s no way we’d ride a bike this whole week (and we’re bikers)! Save yourself and get a cart. As I mentioned, we stayed at Valentines Resort and Marina and loved it. When choosing a hotel, keep in mind that the western coast of the island doesn't have any beaches — just the eastern side. If you want to stay right on the beach, check out The Dunmore, Coral Sands, and Pink Sands — or a rental beach house. Valentines has its own private section on the beach, which was a two second drive away, so we didn’t mind not staying on that side of the island. It’s honestly so small, you can be anywhere in a minute or two. There are restaurants and hot spots all over the island, so you really can’t go wrong with any location! Harbour Island is a big boating island — lots of people come via boat or dock their yachts and stay on them (how do I get this life?!). 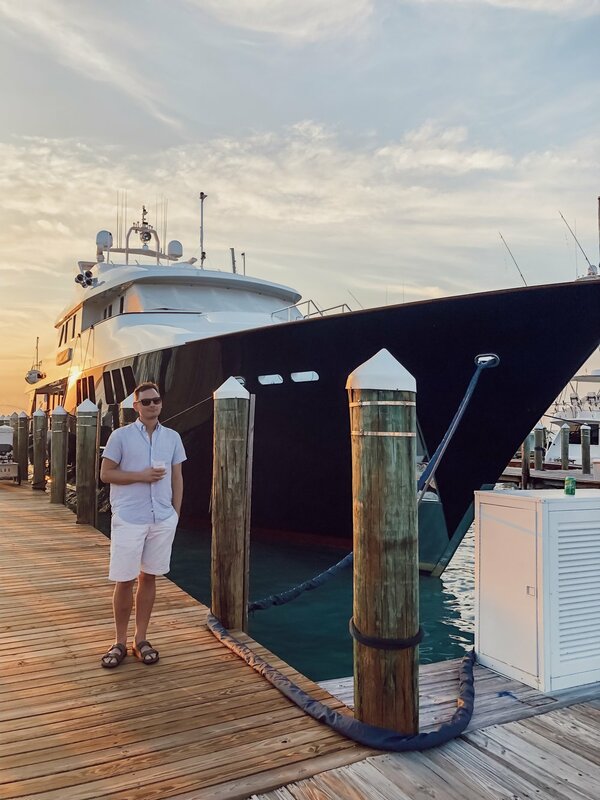 We loved being at Valentines to catch a glimpse of the deck staff and yachters coming and going, and to walk along the docks and get an up-close view of these absolute mega yachts. So cool. If you visit, you definitely need to take a sunset stroll at Valentines and take a peek at these boats! Bahamas Coffee Roasters / A bit of everything! Granola bowls to eggs to lox and bagel. Includes plenty of cute roosters. The Sweet Spot / Healthy and fresh, veg friendly. Great açaí bowl! Arthur’s Bakery / Famous for their cinnamon rolls and baked goods! Best breakfast sandwich on the island (Jim’s words, and he’s a bacon egg and cheese bagel connoisseur)! Cute little patio and the best coffee we had! The Landing / We heard amazing things about their ricotta hotcakes – didn’t get a chance to try them, though! Sip Sip / A Harbour Island classic. Right on the beach with beautiful views, great cocktails, and DELISH food. Get the lobster quesadilla and a Goombay Smash or Sangria. Also the homemade hummus and pita is amazing. You might find yourself here every day! Rooster Tail Bar & Grill / At Valentines – such a cute and breezy open-air beach bar. Marina views, a patio, and great lunch/bar snacks. The Landing / A charming historic hotel with creaky floors and beautiful sunset views. Amazing, limited menu, everything tasted so fresh. Split the crab stack for an appetizer! Fresh carb layered between crispy wontons and a soy glaze drizzle – soooo good. Acquapazza / Amazing Italian menu, and again, sunset views! Perfect for when you want to switch up your cuisine. Located at Romora Bay Resort, which is another marina on the island. Coral Sands / Another beautiful beachfront hotel with a fab restaurant – loved the decor and atmosphere on the patio. Diverse menu with lots of options, and great cocktails! We didn’t know what to expect for such a small island, but we weren’t bored here for a second. Between beach days, boat trips, kayaking/paddleboarding, and tasting the food everywhere, you’ll have no problem filling your days with (relaxing!) activities. We really wanted to get out on the water (and of course, see the swimming pigs!) so we booked a half-day boat excursion with Paulie’s Fishing Charters. We didn’t book in advance — I find it’s better to see how the weather looks and not to try to plan too far ahead. We called Paul up and were able to arrange a trip for the next day, which was amazing. The day was sunny and perfect, the water was SO incredibly beautiful, we couldn’t believe it. Paul took us over to Spanish Wells, where the water just keeps getting brighter turquoise, and we spotted some sea turtles and dolphins along the way! We did some snorkeling and then stopped at Sand Dollar Beach, which is a huge, secluded sandbar that appears in the middle of nowhere. The whitest sand with shallow water stretching out forever — it honestly looked like a mirage! We got off the boat and spent some time on the sandbar, and even spotted some starfish. Then it was off to see the pigs, right near Eleuthera. We were able to feed them for a few bucks, and they coming swimming right out to you! They are not messing around when it comes to food, haha! They were all so cute and there were even some four month old piglets on the island, too. We were glad to check it off our bucket list! The rest of our time was filled with beach days, swimming, zipping around the island, and trying as many restaurants as possible. The beach runs such a long stretch of the island, you can just walk down the beach and pop into several restaurants for lunch — and the views are incredible. You truly won’t need to be “doing” much of anything when you’re here, it’s already enough! If you’re looking to do some shopping, there are several little boutiques to pop into. Check out The Sugar Mill, Island Company, and the Sand Dollar Shop. Our trip exceeded our expectations, and we really felt this island dig itself a bit into our hearts, as weird as that sounds. You get used to roosters and golf carts and the slow pace of life really quickly — especially when you need it. We’re both constantly so busy that it’s amazing what a little reset will do for you, even moreso when your destination is this beautiful and just forces you to chill. We were bummed to leave and are certain that a winter escape will be needed again next year. We have our sights on Bermuda, perhaps — so send me your suggestions for where to head next, if you have them!